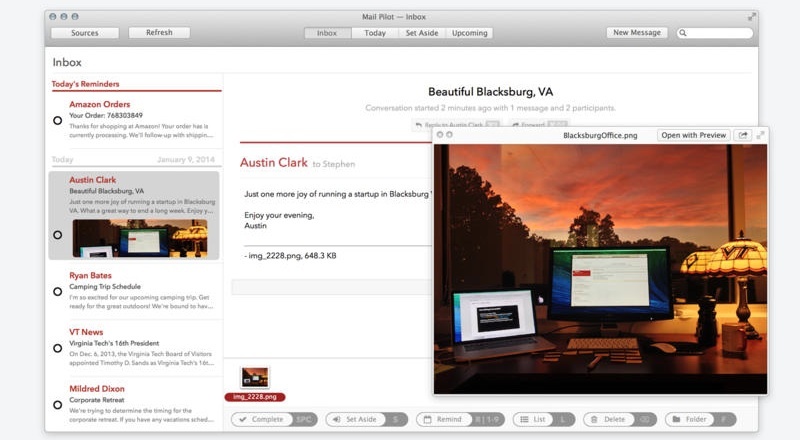 Available as a free public preview since December 3, 2013, Mindsense on Thursday released its Mail Pilot for public consumption in the Mac App Store, priced at $9.99 a pop. Originally a 2012 Kickstarter project, this email application for the Mac promises to change the game by being task instead of email-oriented. What does that mean? Well, all your messages in Mail Pilot are action-based. For example, Mark as Unread becomes Complete/Incomplete, a message can have a reminder attached to it so you can get notified when it’s time to deal with it, you can Set Aside messages that you want to come back to later (great for Inbox Zero fanatics) and lots more. 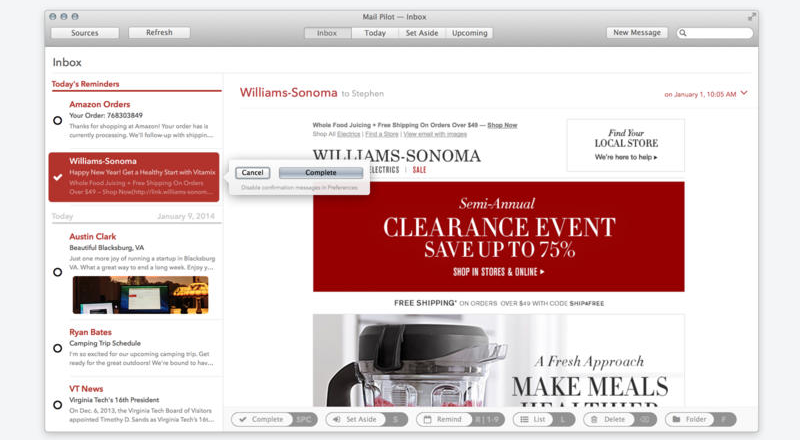 Mail Pilot is the email client reimagined from the ground up. We ignored all notions of common email clients, and we focused on how an email client could fit modern email workflows and uses. Realizing that all email messages are action-based, we developed Mail Pilot and its feature-set to empower users to use email in an intuitive and productive way. 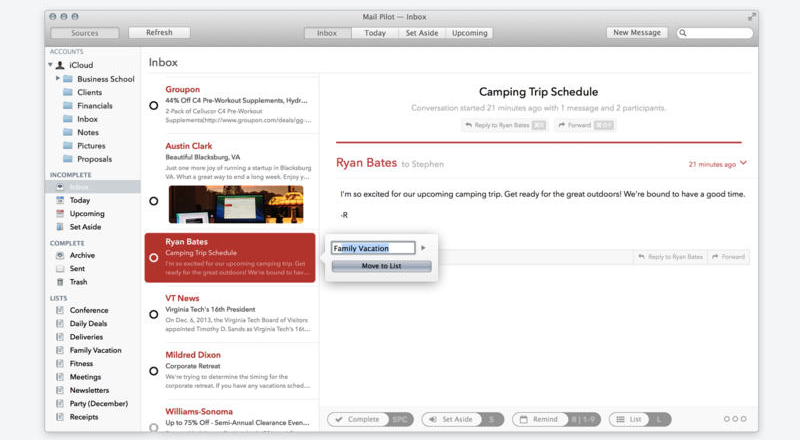 Like Dropbox-owned Mailbox (which still doesn’t have a Mac edition, by the way), Mail Pilot is really an online service with a thin iOS and OS X client. But don’t worry, your email messages are never stored on their servers. What Mail Pilot server do is they keep metadata about your messages, which brings efficiency to your workflow. Also, the servers don’t store your account credentials or message data – this gets securely stored on your device. And lastly, all communication occurs directly between your device and your email server. Because the servers handle metadata concerning your messages, Mail Pilot’s iPhone, iPad and Mac apps can focus on optimizing your workflow with nice management and to-do features. 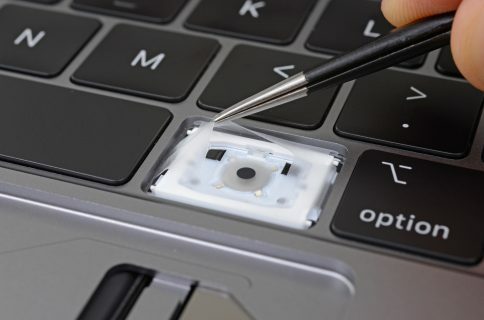 Check out a video walkthrough of the key features. For now, Mail Pilot is compatible with standard IMAP services like Gmail, iCloud, Yahoo, Outlook.com, AOL, as well as IMAP-enabled Exchange email accounts. Email aliases, Send From with a customizable From Name and signatures are also supported. Will the app support POP at a later stage? 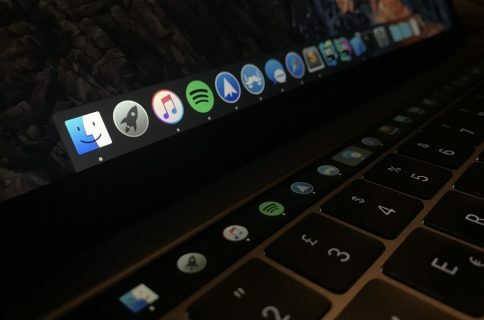 “Mail Pilot is not compatible with POP accounts because they do not allow two-way synchronization,” developers caution. Yes, you’ll receive push notifications for new messages. In addition to the ability to organize your messages using folders and labels (so last century), you can organize based on message status ( Incomplete, Complete or set for Reminder) or aggregate groups of related stuff across all of your accounts using Lists. For those wondering, Complete marks your message as read and instantly archives it and Set Aside files it until later. Another cool feature: Nested Threading. This lets you browse and filter long threads, with quick in-line reply. Check out Mail Pilot for iPhone and iPad. Learn more about Mail Pilot on the official website. 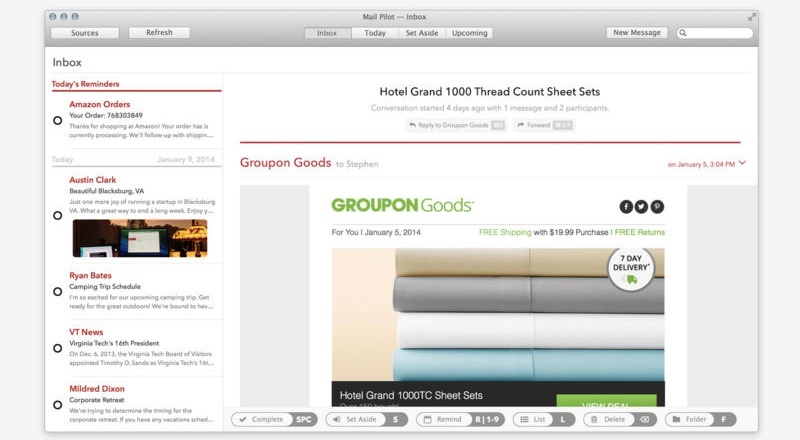 Grab Mail Pilot now for $9.99 in the Mac App Store. This is a limited-time launch price so hurry up before Mail Pilot goes back up to its regular price of $19.99. 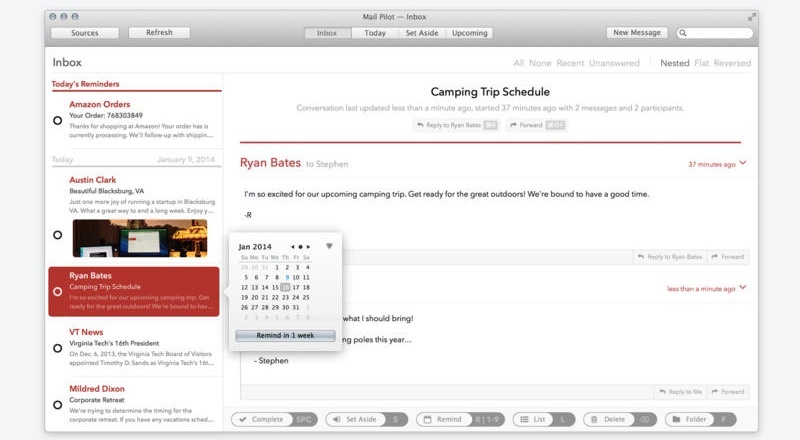 Mail Pilot for iPhone and iPad has been available since April 2013, $14.99 in the App Store.